I'm a sucker for fancy packaging, whether it's for soap, talcum powder, home fragrance or perfume. Oriza L. Legrand presents its collection in beautiful retro packaging, but as we all know, what's on the inside of wrappings often does not do justice to the marketing/design work. With Oriza L. Legrand...it does. Horizon is an amber-y, "orange-scented" patchouli fragrance — its opening notes remind me of Seville orange syrup and chinotto (citrus myrtifolia) mixed with patchouli. The amber accord contains vanilla/benzoin, honey, and leather with a light dusting of bitter cocoa powder. Horizon contains old-style patchouli, not the "modern," scoured patchouli we smell most often today. Thanks to the tart orange, bitter cocoa and pungent patchouli notes, the amber phase of this perfume may appeal to those who normally shun amber fragrances as being too cloyingly sweet. Horizon smells rich: it is powerful and its materials smell top-notch. As it dries on skin, Horizon's resinous patchouli intensifies and is joined by boozy wood and "tobacco-musk" (the almost-dirty aspect of tobacco leaf). The extreme dry down is pure, classic (but sheer) amber. Horizon has great lasting power and sillage, is unisex, and, due to its heft, seems best suited for cool/cold weather. Relique d'Amour begins with the aromas of dried herbs and mothballs; in fact, place those herbs and mothballs inside a fragrant cedar chest, and you can imagine the opening of this perfume. The cedar chest I knew best in childhood was my mother's; I opened it often to smell the lovely silky aroma of smooth evergreen wood. My mother also kept soaps (wasteful...for she never used them) in her cedar chest...and after a few minutes on skin, Relique d'Amour smells a bit soapy, as if you've just opened a fresh box of fragrant "white flowers" soaps. This floral note wavers between the scents of tuberose and jasmine (not any "white lily" I've ever grown or smelled). As Relique d'Amour dries on skin, I detect hints of soft incense and myrrh. If you want to smell "clean," without resorting to white musk and ozone/fresh notes, try Relique d'Amour. I started not to say this, but in fairness will: on certain days I wore Relique d'Amour I thought: "funeral parlor." There's something spooky about the incense and flowers and mothballs. A visual came to mind: a silent film scene — wild-eyed Lilian Gish swooning over a glossy black casket, organ soundtrack blaring, and banks of flowers everywhere. "OH, NO! (sob, hands tugging on undone tresses)...why, why did he die? Death! DEATH! Give him back to me!!!!!!" Don't let that scare you away, though! Relique d'Amour is a feminine perfume with soft sillage and good lasting power. Chypre Mousse smells heavenly from the first spritz with its lush mint-fennel notes. A hefty dose of oak moss appears next, accompanied by galbanum and an old-fashioned (think vintage Houbigant Fougère Royale) fern-forest accord with some clover thrown in. Chypre Mousse has a sparkling, lively, "living" character, as if one is standing between a sunny summer meadow and a damp-dark woodland with its aromas of evergreens and fresh, damp earth. And as a surprise, there is a note in the dry-down that smells of warm chestnuts. Without exception, everyone who I've let sniff Chypre Mousse said the equivalent of "Wow!" (and that's "wow" in a good way). Though I have more scents to try in the Oriza L. Legrand line, I have a hard time believing Chypre Mousse will be dethroned as my favorite. The Oriza L. Legrand perfumes reviewed here are an interesting bunch: perfumes inspired by the past but with contemporary touches. I can't wait to try all perfumes in the collection...and the soaps...and candles. Oriza L. Legrand fragrances come in splash bottles (with a screw-on atomizer spray included with each perfume). 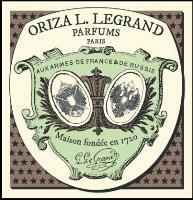 For buying information, see the listing for Oriza L. Legrand under Perfume Houses. I’m sampling Chypre Mousse today, and it really does have a huge wow-factor. I’m not always a fan of chypre but this is something else, and quite different from others that I’ve tried. It manages to be fresh and very powerful at the same time and is so memorable. I just used two sprays from my sample and the projection and longevity are terrific. I would love a full bottle but 50 ml would probably be enough, bearing in mind how potent it is. Unfortunately the FB is 100 ml, which would probably do me for the rest of my life. 2rista: same here…a “discovery set” a la Hermessences would be great for this line. Actually they say 7 on the website but when mine arrived they actually sent 9 so they gave me one of everything in the range for the same price. They arrived from France 2 days after I ordered, in a handwritten envelope which was much nicer and more personal than a computer printed one ! Great article, Kevin! Chypre Mousse and Horizon sound right up my alley, will have to seek out samples of these. relleric: thanks…hope you like ’em. I sent off for a bunch of samples and they arrived beautifully wrapped with a handwritten note and envelope. The perfumes are beautiful but my favourites are Chypre Mousse and Reve d’Ossian. The others are lovely but too old fashioned for me now – but beautifully balanced and lovely – I’ve just realised this review is full of the word “beautifully” and they are – true French perfumes!! Chypre Mousse is really unusual and is really long lasting – its a sharp earthy chypre but on my skin I detected a violet note too amongst the mosses and earth and its lovely! It also has a medicinal element which reminded me of an old apothecary. I will definately buy a full bottle at some point. As for Reve -its really lovely too – a flowery frankincense but its so beautifully balanced – not so long lasting on my skin but on my clothes it lasted at least 18 hours. It reminded me of an old old favourite of mine from the 1970’s – Ritz – by Charles of the Ritz. Does anyone remember that?? I doubt it but its very similar and I wore it in the heady days of Laura Ashley dresses with yards of skirts and bold jewellry and bright suede platform sandals!! Oh I must have looked a fright! But we all did……but Reve is lovely and a full bottle of that is on the to buy list…….exquisite and well crafted perfumes. I looked like that too. I think we looked fabulous! Kate: oh, good…have not tried Reve yet…or the new Vetiver either. Kevin, thanks a lot for your review, as always, it´s been a pleasure to read. I´m familiar with only one of the perfumes from the Oriza L. Legrand line, namely “Horizon”. I´ve got to admit I´m normally not into patchouli-centred fragrances, but the patchouli note in “Horizon” is surprisingly pleasant and well-mannered (perhaps thanks to the softening effect of the cocoa powder note). And the delicate amber base is absolutely heavenly! Now I´m keen on exploring other fragrances from this house, especially the supposedly exquisite “Chypre Mousse”. Karenin: you’re welcome; I grew patchouli plants on my hot front porch for a few years and the patchouli note in Horizon smells so much like the plants…natural and not TOO dense. Love the packaging on these! Really beautiful. You don’t see labels like that any more. floragal: I know…I think I’m about to, a-hem, “explore” the soap range, too. Not much tempts me anymore, but these do. I’ll have to try their sample set. Great reviews, Kevin. Thanks! I’d be interested in smelling like a spooky funeral parlor. I have no idea why. Horizon sounds really good too. Poodle/Noz: you’re both a credit to the Perfume Loving Tribe. hajusuuri: Chypre Mousse seems to be THE hit from the line…. I have a sample of Chypre Mousse. I’m finding my nose confused by the minty surface with those humous notes underneath. I should try it again in the fall. It’s certainly more complex and natural smelling than most perfumes I’ve tried in the last year. I’d like to try some of the others, too. The packaging looks very enticing. The next time I’m in Paris I’d love to visit the shop, I bet that’s a real treat and thanks for the reminder about the soaps (ahem). I got decants of Chypre Mousse, Reve and Relique earlier this year. 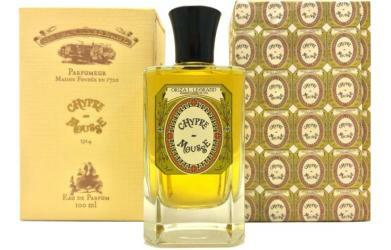 I still haven’t got my nose around Chypre and believe I have the same confusion as Nozknoz above – I know there’s lots else to smell but I latch onto the mint and mushroom facets which are then amplified in my mind. I’ll try again. It’s certainly one of the most intriguing scents I’ve ever smelled. There is a meditative quality to Relique (though I get your spooky funeral parlour too). I’d love a candle in it! Relique does sound ideal for a candle! Dona & Noz…Relique d’Amour does come in a candle…40 euros. When I ordered mine they sent 9 samples so I guess for the same price they send everything in the range – guessing they hadn’t added the new ones when you ordered so sent the 6 they were doing then (?) 9 euros for a full set of samples was a bargain ! I have Rêve d’Ossian and plan on getting Rélique d’Amour too. I like the funeral parlour image.